It would be fair to say that Jennifer Aniston’s film career has been a series of diminishing returns, with a long list of films making use of Aniston’s comedic talents in mediocre romantic comedies that she can perform in her sleep. 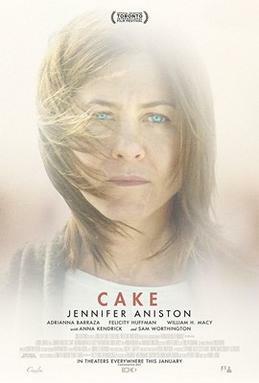 ‘Cake’ is a departure from these kinds of films, an independent drama that features Aniston’s best performance in years and a chance for her to show off her dramatic chops. The film introduces us to Claire Bennett (Aniston) at a support group, at a meeting taking place not long after a fellow group member has committed suicide, Nina (Anna Kendrick). The group is for people who are in chronic pain for one reason or another, and the film slowly parcels out information which reveals why Claire has ended up there. Aniston plays Claire with a raw sense of authenticity, portraying a woman who is often rude, unapproachable and difficult for the audience to sympathise with. Despite this, Aniston’s performance is always compelling and the film gradually lures you into her mindset as it reveals the events that led Claire to push everyone away. The biggest strength the film has besides Aniston’s performance is the relationship Claire has with her hired help, Silvana (Adriana Barraza), which grows throughout the film and shows the moving connection developed between the two. It’s not always clear why Silvana puts up with Claire’s behaviour, but Adriana Barraza imbues Silvana with a quiet sense of dignity that drives her to help Claire even when it could be argued that it isn’t worth her time. Less successful is the attempts to weave Nina into the narrative, with the scenes where she appears coming off less poignant and more hokey. The purpose is to help Claire overcome her demons and to start moving back into a state of normality but this could have been achieved through her scenes with Silvana, with Nina’s widower Roy (Sam Worthington) or by developing William H. Macy’s character beyond the one scene he appears in. My mind is drawn to the excellent film ‘Rabbit Hole’, a similar study of grief that succeeds more because it provides greater scope to its narrative and provides a sense of closure to its characters. Despite the painful subject matter, ‘Cake’ is very funny on occasion, with Aniston’s dry line delivery leading to many laughs. Overall, the film is a little too slight and it never builds on Aniston’s excellent performance to be something greater, but as it stands this is a charming independent film and I enjoyed it.